I first saw Unravel at the same time everyone else did, during the 2015 EA E3 press conference. I remember it because not only did the game look stunning, but the dude that gave the presentation, Martin Sahlin, gave the kind of honest, nervous, shaky performance that never seems to make it on to professional stages these days. It's a shame too, because his passion for the project sold me on whatever it was going to be, and I am happy to say that every ounce of passion he nervously poured out on that stage shows from Unravel's first minute onward. Opening with an elderly woman making her way up a set of stairs with a basket of yarn, Unravel stars the red yarn ball that she drops. Climbing up on to the table in her living room in the form of a little red yarn fox person, Yarny, as he is affectionately called by the developers, runs right into the heart of his little world, a scrapbook with missing pictures and smudged out words. Filling out this scrapbook, replacing the blurry memories and broken photos within it, is Yarny's reason for being, but it's never explicitly said why, nor does it ever really need to be. As a big stickler for lore, I was surprised at how much I enjoyed Unravel's lack of any real narrative. Instead, what's presented is this mysterious “broken” scrapbook. To fill it out, Yarny ventures off the table and into the foyer, where he finds pictures of the old woman's youth, and enters those pictures, or memories if you will, like they were each a small pensieve right out of Harry Potter. Each of these pictures make up a different level of the game, and Yarny has to make it across each one, collecting the old woman's memories, which show up like floating pictures made up of thousands of tiny fire flies, until finds a small yarn trinket at the pictures end. The trinket is then placed on the front of the scrapbook, at which point Yarny transfers the memories back, filling out the book in the process. 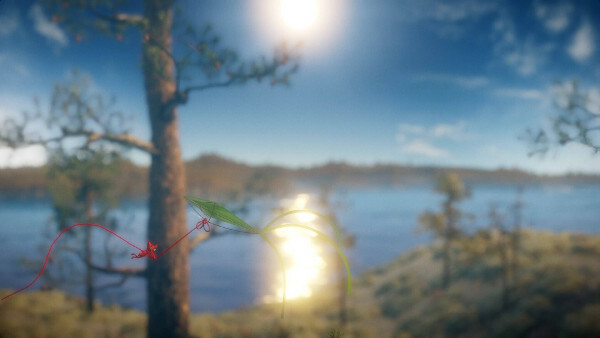 Unlike a story akin to Gone Home, where the pieces of narrative eventually come together in some kind of revelation, Unravel is entirely about the journey, following a life through important, yet seemingly innocuous moments that are given new meaning when looked at through the eyes of a small, red yarn doll. Controlling Yarny through this journey is an absolute joy, as Unravel uses a few simple mechanics to make moving around the world a thing of beauty. Key to his movement is the fact that Yarny himself is constantly unraveling, and can even run out if he moves to far without finding one of the many random yarn spools that act as checkpoints. Yarny can also use his yarn as a whip or lasso, throwing out strands that he can climb or swing on. To break it down another way, Yarny is like a little, red Indiana Jones, working his yarn the way Henry Jr. worked his leather bullwhip. On top of that, he can tie portions of himself off, allowing his trailing yarn to form bridges to help move small objects, or even provide a little bit of a boost for some higher jumps. The levels themselves use all of this to their advantage, and they force Yarny to swing, jump, swing, make bridges and solve small environmental puzzles to push forward. Most of these are fairly simple, and none of them move beyond more then just moving a couple of small pieces around to make reaching out of reach ledges easier. There were a few standouts, like a spectacular kite ride, and a rather scary trip up the side of a mountain amid a rock slide, but even those only required a couple of repeats in order to get right. The true standout of Unravel, and the thing that initially caught me from it's very first showing, is the environments. Through a combination of weather and setting, Unravel is perhaps the most beautiful game I have ever played. Yarny's journey takes him through a variety of settings across all four seasons. Through rain, swamps, ice, and even a horrendous blizzard, Unravel uses every part of its environments to tell its tale, with some of the most incredible parts of Yarny's journey coming through the snow covered ground towards the end of the game. If a picture is worth a thousand words, I don't believe there are enough words out there to describe just how amazing some of the vistas were, and I am not one who is prone to hyperbolic indulgences when it comes things of a graphical nature. Clocking in at a little under 6 hours, there was no part of Unravel that I found wanting. Great visuals, excellent mechanics, and a satisfyingly sweet, personal narrative background make this a complete no-brainer in my book. I adore this game, and if you have any kind of a heart beating inside of you, I have no doubt that you will too. In focusing on the cerebral side of Sherlock Holmes, Sherlock Holmes: Crimes and Punishments manages to rise above its adventure game roots, presenting an excellent take on a classic character that, while propped on a foundation of less then interesting tropes, manages to feel fresh and captivating. While the physical act of moving around the environment left a lot to be desired, especially when a good portion of the game is spent looking for clues, it shouldn't be a deterrent to any fan of the great detective or adventure game fans in general. Trust when I say that missing this game would be drawing the wrong conclusion indeed.